Review date: 24 January 2000. Moving pictures from digital cameras to computers can be a problem. If you've got a camera with a USB (Universal Serial Bus) connection, like the Kodak DC2xx series (I review the DC220 here) or the Sony DSC-F505 (reviewed here), you can just plug the thing straight into your PC or Mac and move pictures quickly and simply. To do this, you need a computer with USB ports, and an operating system that can use them - on the Wintel side of things, that pretty much means Windows 98 or 2000. The second nothing-more-to-buy option is to use the serial interface which pretty much all consumer cameras have. This'll work on any old computer that can run the transfer software. But it's slow, slow, slow; try three hours to move the entire contents of a current 128Mb memory card! For smaller picture sets, serial is perfectly adequate, and it's also fine if you're not in a hurry and have an AC adaptor for your camera. Leave the serial transfer chugging away in the background for as long as it wants to run, power the camera from the AC adaptor so your batteries don't go flat, and you'll still end up with your photos all on your computer rather sooner than you'd get film back from processing. If you can stand to outlay a dollar or two, though, a card reader is the way to go, and a USB card reader, if your computer can use it, is the simplest option. I've checked out two A-TEC SUBSYSTEM Cobra 2000 USB readers, which each retail here in Australia for $AU130. They're obviously trying to set some sort of record for ungainliness in a product name (although the A-TEC home page makes up for it somewhat with its enthusiastic "Look! the product is so beautiful! "), but everything apart from the name is very elegant. The readers I checked out were exactly the same shape, but quite different in appearance. The CompactFlash reader was plain beige with green and blue bits; the SSFDC reader was yet another translucent Bondi Blue iMac-matching gadget. Judging by the pictures on the boxes and the A-TEC site, they make the SSFDC readers in drab colours as well. Maybe you can get see-through CompactFlash readers. For the same money, I'd go for the show-off version, personally. Apart from the colour and the kind of card they're made to accept, the two readers are exactly the same. They're both about the width and thickness of a pack of cards, but not as long. They have no separate power supply, since they draw all the juice they need from the USB connection. And they've each got a green and an amber LED on them; the two lights glow constantly most of the time, but the amber one flashes when read or write operations are in progress. Installing the Cobra readers lives up to the USB promise - you plug the reader into your USB hub or directly into a spare port on the back of your computer, your operating system detects it, and you feed the computer the CD with the little driver file on it. Well, you do as long as you're running Windows 98, anyway. There's no driver for later Windows flavours (2000, XP...) for either of these readers. If you've got 98, though, there's no rebooting, no mucking about, and once the driver's installed you can plug and unplug the reader all you like without reinstalling or rebooting. A new "removable drive" turns up in your system, and any time there's a card in the reader, you can access it like any other system device. The CompactFlash reader, however, only handles Type 1 cards, not the 5mm thick Type 2 cards. This is no big deal, since pretty much every CompactFlash card out there is Type 1. If you've got one of IBM's amazing little Microdrives, though, be warned that it won't fit in this reader. The quick installation process makes the Cobra readers highly portable. The driver software will fit easily on a floppy disk; in a pinch, you could send it as an e-mail attachment. And apart from the software, all you need is the reader itself; no power cable, no plugpack. The thing'll fit in a pocket. A side benefit of these no-fuss plug-and-go card readers is that you can use the cards as ordinary removable storage, as well as in your camera. Now, CompactFlash and SmartMedia cards are, at more than $US2 per megabyte, much worse value for money than any other kind of transportable data device. But if you've already got some good-sized memory cards that you don't need to use in your camera all of the time, why not use 'em for shifting files from place to place? You can move the reader as well - little ones like the Cobras certainly aren't much trouble to take with you - or you can set up other readers on other computers. Expensive they may be, but memory cards give speed not too much lower than that of the ubiquitous Zip drives, with much smaller media. A CompactFlash or SmartMedia card will easily fit, even in its protective case, into the little "Zippo pocket" on the front of a pair of jeans. And it won't care about magnetic fields, condensation-causing temperature changes, or quite serious shocks. Super-tiny media aren't really likely to be very important to you unless your business involves cars with ejection seats and women with really implausible names, but there's an undeniable Star Trek appeal to taking that 120Mb download home from work on something that can hide under a postage stamp. Even if this scenario doesn't appeal to you, making your digital camera transfers finish before digital computers go out of fashion ought to. The Cobra readers are small, simple, cute and not very expensive. I'm keeping the CompactFlash one. 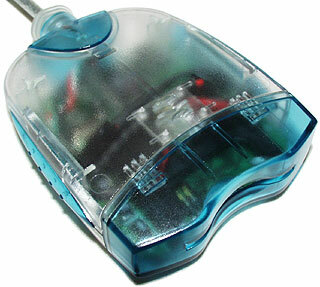 Aus PC Market no longer sells the Cobra card readers, but they've got plenty of others! 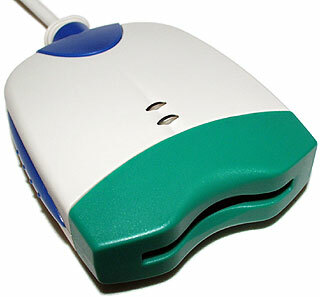 Parallel port card readers can be OK, if their driver software works properly. They cause a large performance loss when they're transferring data - a standard problem when parallel ports are used for sustained high-rate transfers - but you're not using them as a system scratch drive, so practical paralysis of your computer just while you're moving photos is no big deal. They can move a megabyte every couple of seconds with no trouble, so the slow-down only becomes an issue if you're dealing with quite large amounts of data rather often. But if a parallel device's driver software is flaky - as it often is - they can be a pain. Rebooting over and over to see if the driver feels like working this time, or just uninstalling and reinstalling the reader in order to make it work, gets old fast. Parallel readers are also useless for Macintosh users, because Macs don't have parallel ports. IDE card readers plug into the same interface that's been used for PC hard drives for years and years (and CD-ROM drives for almost as long). Modern PCs have twin IDE connectors on the motherboard, each of which can support up to two devices, so it's usually easy enough to find room for an IDE reader. Recent Macs have IDE controllers, too. IDE readers have to be internal devices, though, because IDE cables can't be longer than 40 centimetres (18 inches). If you're out of externally accessible drive bays, or you've got four IDE devices already, or you want a card reader you can easily take with you to another computer or use with a laptop, IDE ain't for you. SCSI readers work in any computer with a SCSI controller - older Macs, PCs with high end motherboards, or any computer with a SCSI card. SCSI controllers can all handle at least 7 or as many as 15 devices, so you can probably fit a card reader into the chain. But most such readers are internal devices - they can be external, but usually aren't, unless you mount them in a general purpose external case. And they're not cheap; even if you have a SCSI controller already, the reader itself will be considerably more expensive than any other option. Which leaves USB. Universal Serial Bus is perfect for card readers. Its 12 megabit per second maximum transfer speed means you can, in theory at least, shift an easy megabyte per second to or from a USB data storage device; not hard disk speed, but not too far from it. In practice, you don't get this much pep out of any USB card reader I've heard of. How quickly you can actually move data to and from cards depends on the type of card, for CompactFlash devices; CompactFlash cards have their controller built into the card (they're actually a kind of IDE device), and controllers vary in speed. Solid State Floppy Disk Cards (SSFDCs, also known as SmartMedia) have the controller built into the devices you use them in, and so are more even in speed, although the controller design still plays a role. They're about as fast as the faster CompactFlash cards. Either way, you're talking at least 200 kilobytes per second, even from the crummiest old CompactFlash cards, and maybe half a megabyte per second from the best cards. Since you're not paralysing your computer or sucking the batteries out of your camera, USB card readers are plenty fast enough even at only 200k/S. You're still only talking about ten minutes for a full 128Mb card, and you can start viewing and manipulating files as soon as they're copied, so you don't have to wait for the whole transfer to finish.